Four different brake options were offered for the 2012+ F30 328i/iX and F32 428i/iX - the standard ("base" model), M Sport trim package, M Sport Brake upgrades, and the M Performance accessory upgrade. There are two brake specifications labeled as "M Sport" and they are completely different. The M Sport option is made more confusing with fuzzy listings in the BMW ETK, RealOEM, and misinformation spread around the web. And most of the information out there is for the 335i M Sport brakes, which are different than the 328i. The 320i and 320d were never offered the M Sport Brakes upgrade for the US market. Most of the components in the M Performance accessory kits were shared among all models. 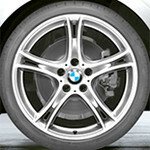 Single piston calipers are the traditional brake caliper design on BMWs. They will be a grey/unfinished color. If you ordered your 328i/428i with the $3,400 M Sport trim package (M Sport aerodynamic package, 18" wheels, M steering wheel, Shadowline trim) you also got a modest brake upgrade at the same time. The front rotors increased from 312mm to 330mm. The rotors are a blank design, not dimpled/slotted. The stock single piston calipers remained but use a different bracket. The pads are slightly more aggressive than the stock parts. Note that there was another M Sport Brakes upgrade option that had Brembo calipers from the 335i (see below). My car has painted Brembo calipers. 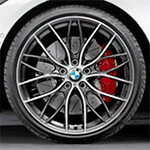 BMW offered two brake upgrades as options that used Brembo calipers in the front and rear. Larger rotors were also part of the package. 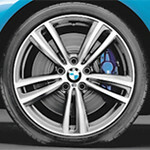 The M Sport brakes were a separate option (code S2NHA) available across all lines and option packages. You could have a base 328i with no other options except M Sport Brake upgrade. In the US it was a $650 option. The M Sport trim package (code P337A) was a separate option and had its own brake spec (see above). So you can have an M Sport 328i trim package but not have the M Sport brake upgrade. 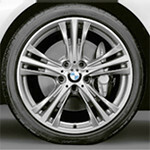 To get the larger M Sport brakes you had to select that option during the car's order process. To confuse things further, the front calipers and rotors are the same spec as the stock F30 335i brakes. Even the rotors are the same part number. The rear calipers are a 2-piston Brembo which is the same kit used on the M Performance kits (see below). Front and rear calipers should be painted blue with an ///M logo. The pads in the M Sport option were an aggressive Euro-spec pad - they have a lot of feel and grab quickly but dust quite a lot and are prone to squealing noises when not driven aggressively. There are pad alternatives that are milder if you have the M Sport brakes and are not happy with them. For some reason the rear rotor is bigger than the front. It could be a bit of cost-saving on so BMW did not have to release and support a 328-only rear kit for what is likely a low volume option. The M Performance kit was available from the dealer as an accessory retrofit. You paid for it separately (over $2,000) and either the dealer or the pre-delivery center installed them. The front brakes are massive 370mm/14.5" in diameter and the rotors were dimpled and slotted. The rear rotors are 345mm/13.6" with a 2-piston Brembo caliper. The M Performance brake pads were actually milder than the M Sport brake upgrade pads. This was good for people who wanted the big brake look without the noise and touchy response of racing brakes. If you're not a fan of them, the M Performance pads could be swapped out for the M Sport upgrade pads. For more information on the 335i brakes, including detailed info on pads and rotors, visit the 335i brake FAQ by clicking here. R: 34216850570 lots of initial bite but also lots of dust; performance drivers will like this pad a lot but daily drivers will probably dislike the amount of dust from them; if you were unhappy with the brake feel in your stock setup you can swap the M Sport pads in for an immediate improvement. R: 34216855474 low dust and low feel; a lot of M Performance customers have been put off by the pads that came with this kit - they're dull feeling and totally out of character with what they expected. In this case we recommend using the M Sport pads with more bite. Why a different rotor on the rear of the Convertible? Because BMW felt that the N26 needed a larger parking brake mechanism. The rotors are the same diameter and the pads are the same. But the center hat is a different size and the parking brake contact area is wider. You can tell a N20 vs N26 by the emissions label on the underside of the hood (N20 = ULEV; N26 = SULEV). And to further confuse things, this issue only applies to the F33 Convertible (not sedan, coupe, wagon, GT, or Gran Coupe)! Information is inconsistent on how the S2NHA can be ordered. It doesn't appear in either the 2012 or 2013 official ordering guides but does show up in BMW ETK, Real OEM, and owner's forums. In the official 2014 ordering guide S2NHA requires 2PE and 0ZMM/P337A. In the 2015 ordering guide, they relaxed the requirements to only bigger wheels with performance tires and top speed increased. So in theory, you could have a base model 328i with no other options except for the upgraded brakes, wheels/tires, and increased top speed.